"I like to connect abstract math with things that are really concrete," says Skip Garibaldi. Photo by Bryan Meltz. As a graduate student, Emory math professor Skip Garibaldi visited the Orangerie Museum near Paris. 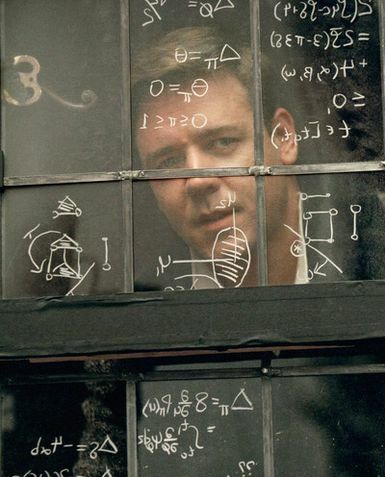 He and a friend, a fellow mathematician, were transfixed upon entering one of the museum’s galleries. 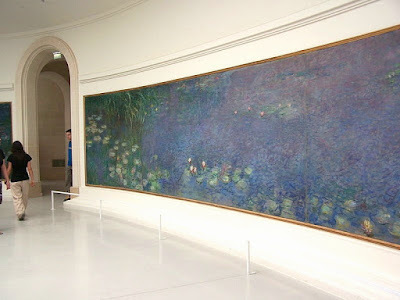 But it wasn’t the stunning mural of Claude Monet water lilies that grabbed their attention. “I said, ‘It’s a whispering chamber!’ And we immediately ran to opposite ends of this oval room and began having a conversation,” Garibaldi recalls. No plaque identified the whispering phenomenon. 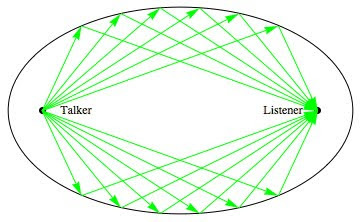 But the mathematicians recognized the geometry of ellipses that allow sound waves to travel around walls without getting much quieter. Now Garibaldi is himself part of a museum exhibit that opened this month at the Smithsonian Institution. “MathAlive!” aims to reveal the beauty of math to middle and elementary school students, by showing it through the eyes of hip young engineers, designers, urban planners, athletes and others who use math in their work and play. The interactive MathAlive! exhibit combines math with virtual reality to let visitors do things like design a skateboard, and then test it out to see how it works, or operate a robotic rover to pick up samples from the surface of Mars. Garibaldi, who is an avid rock climber, inspired an actual climbing wall at the exhibit. Watch a "fly-through" of MathAlive! in the video below. The traveling exhibit is a collaboration of the Raytheon Company, NASA, the National Council of Teachers of Mathematics and others. In addition to the Smithsonian, MathAlive! will travel to the Arizona Museum and the U.S. Space and Rocket Center in Huntsville, Alabama. The philosophy behind MathAlive! is that one way to get kids interested in a subject is to find a way to make it fun and cool. Popular books and movies guided his own meandering trail through academia, says Garibaldi, who grew up in semi-rural Fairfield, California, on the edge of the Central Valley. Garibaldi became fascinated by physics after an uncle gave him a copy of “The Cosmic Code” by Heinz Pagels, a physicist and mountain climber who had a gift for explaining complex topics in ways that were both gripping and easy to understand. Pagels was a larger-than-life figure who embodied what he wrote. 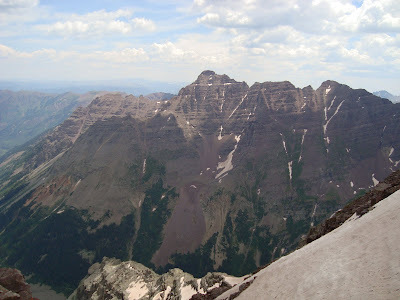 In 1988, he died while climbing Colorado’s Pyramid Peak (above), in an accident that was eerily similar to his dream. Another book that influenced Garibaldi was “Surely, You’re Joking, Mr. Feynman: The Adventures of a Curious Character.” This classic memoir by Nobel Prize-winning physicist Richard Feynman covers everything from safecracking to meeting Albert Einstein. By the time he was a sophomore in high school, Garibaldi had taken most of the math and science courses offered in the vicinity of his small town. So he decided to skip the rest of high school and apply to college. He enrolled at Purdue. 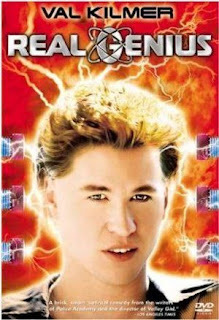 “Looking back on it, it seems like a crazy idea,” Garibaldi says, “but it didn’t seem strange at the time.” He explains that he had recently seen the movie “Real Genius,” starring Val Kilmer as one of the youngest students ever accepted to study physics at CalTech, where he and a roommate develop a high-powered laser. Although he enjoyed the theoretical aspects of physics, Garibaldi says he didn’t like working in a lab. He switched his major to computer science in his junior year at Purdue, but once again hit a wall. 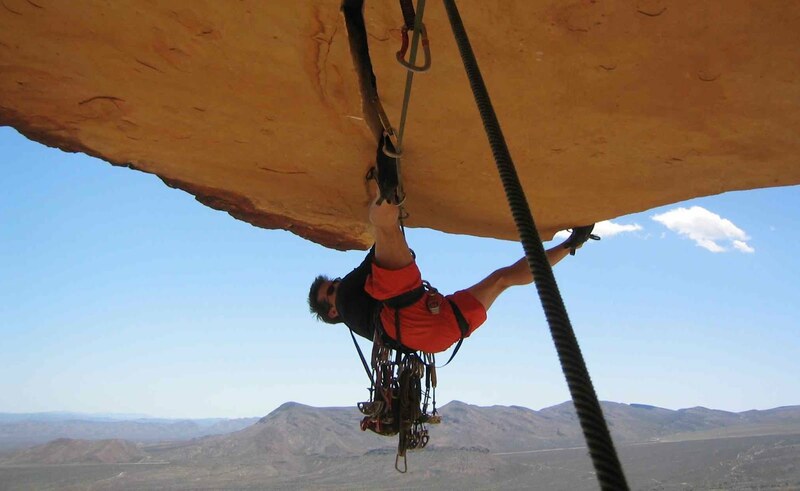 As he immersed himself in becoming a theoretical mathematician, he discovered a twin passion: Rock climbing. Garibaldi climbing Desert Reality in Red Rock Canyon National Conservation Area near Las Vegas. Photo by Craig Clarence. 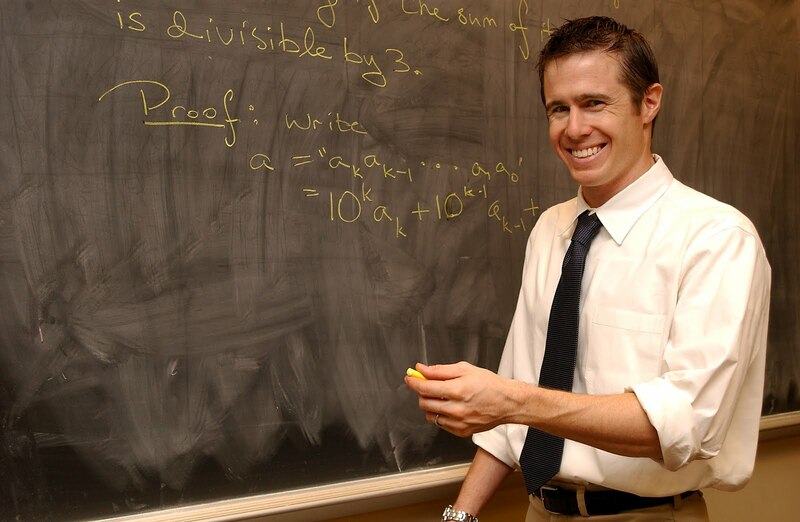 Garibaldi met his wife, Julia, a fellow mathematician, while at UCLA, and the couple moved to Atlanta in 2002 when he joined the Emory faculty. 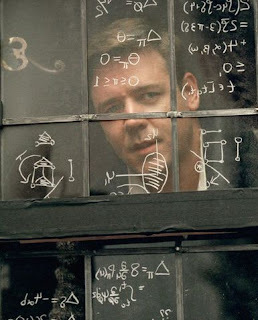 The math department was seeing a rise in enrollment, which Garibaldi thinks may have been at least partly due to more appearances of math in popular culture, like the movie “A Beautiful Mind.” Russell Crowe (left) played real-life mathematician John Nash in the hit movie, which won the 2002 Oscar for best picture. I think a mathematician would see the Monet mural, and think "wow, look at the size of that blackboard, imagine the formulae I could prove on that"
This is fascinating - what a great profile! It also answers the question I ask people quite often - what do you see when you walk down the street? As a writer, I notice infinitely small details. The scuff on someone's shoe, the pace at which a ladybug crosses a leaf, the fifty shades of orange in a flower bloom, the sweep of someone's hair as they walk. I listen to the cadence in a person's voice and observe gestures and physical interaction. My artist father-in-law observed angles in architecture, contrast between light and dark, negative and positive space, variations in surface textures. My son is most aware of his surroundings through the sounds and rhythms they make - he is a musician. Fantastic exploration of a highly talented individual with a brilliant mind. Bravo!